There are a couple of things to note. 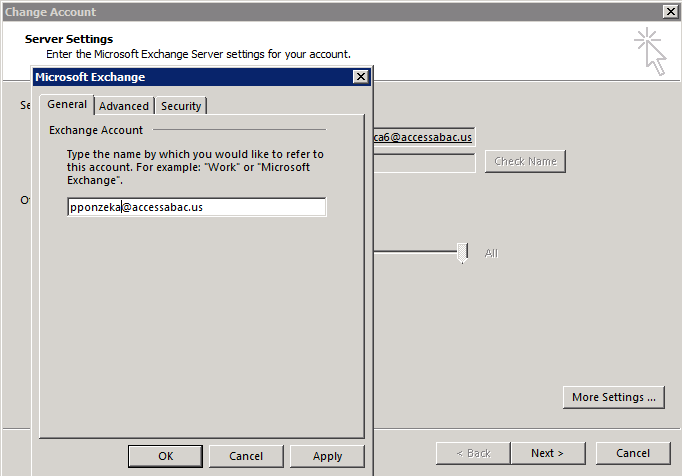 There can be issues connecting BACK to Exchange 2010 mailboxes through Exchange 2013 SP1 CAS servers if you JUST have MAPI/HTTP enabled. RPC over HTTPS or Outlook Anywhere is here to stay for a bit. After that is completed, we need to enable MAPI/HTTP for the organization. Ensure that this will not cause issues in your Exchange Organization before you do it. If you have an existing Outlook 2013 SP1 session open, you will most likely see the message: “An Exchange Administrator has made a change that requires you to restart your outlook”. 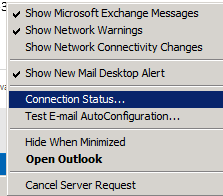 After you restart it, and go to connection status (hold the Control Key and right click the Outlook icon) you should see a set of connections using “HTTP” instead of “RPC/HTTP”. RPC/HTTP is Outlook Anywhere, where HTTP is MAPI/HTTP. Notice all my connections are going to Server name https://mapi.accessabacus.com and using the Protocol HTTP. Notice the Protocol is Exchange MAPI HTTP. You can see the Exchange HTTP below it. 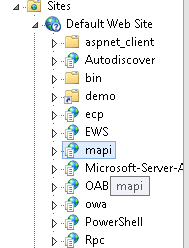 Exchange HTTP is Outlook Anywhere, where Exchange MAPI HTTP is the new MAPI/HTTP. Note that the connection tab is missing. Notice how the proxy server is “email-ph.lab.accessabacus.com”, the server name is PHDC-SOAEXC01, which is my Exchange 2010 Mailbox Server with a legacy public folder database. Lastly note the protocol is RPC/HTTP. Now, I in NO way think this is ideal, as we are straddling not only two protocols (MAPI/HTTP and Outlook Anywhere), two namespaces (email-ph.lab.accessabacus.com and mapi.accessabacus.com), but look at the screenshot. 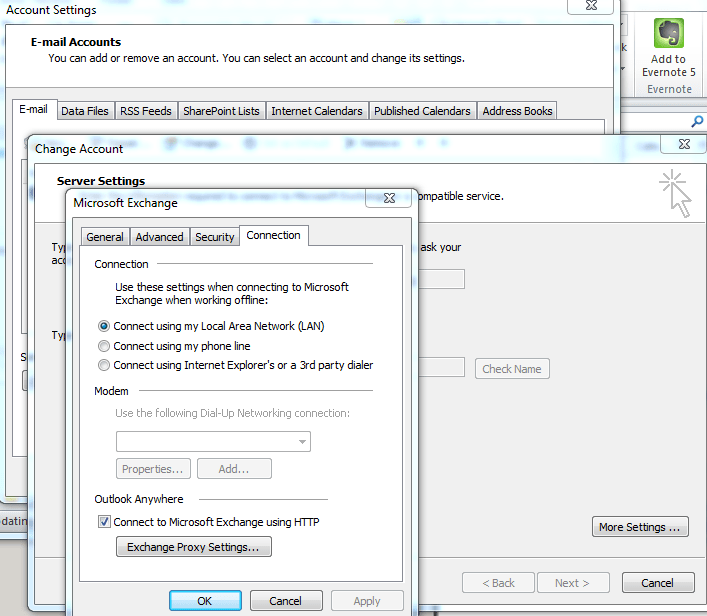 We are using two separate authentication methods where MAPI/HTTP is Negotiating, where Outlook Anywhere is using NTLM. Care should be taken again to ensure your organization can properly support connections so that they are using one or the other. You can also use that to troubleshoot. If for some reason MAPI/HTTP is not working, check that key. If its set to value 1 and you want to ENABLE it, you can do so by setting the value to 0. If you need to mass deploy this you can so with a script, or Group Policy. We will see how the performance of the new protocol works, as well as any other changes that need to happen as a result of this new architecture. I have done all that. My connection in Outlook still shows RPC/HTTP and I also checked the registry and there is no file to disable. Thanks. Have you upgraded your office to 2013 sp1? Is your certificate name right and trusted? I’m having the exact same problem. The certificate appears to be valid, and SP1 is currently installed. I’ve checked and triple checked, but unless I explicitly set the ‘Use RPC on fast networks’ setting in Outlook, clients cannot connect. this creates a small problem, becuase the autoconfigure does not work, and addtionally throws an error. It requires going into the ‘more settings’ screen and selecting RPC over HTTP and also specifying a prxoy. Quite annoying. This was finally fixed after installing Exchange 2013 CU8. I have MAPI/HTTP working just fine when connected at Office. But when I’m connected through Direct Access (VPN) it doesn’t work. The Connection status shows Error in the Authn column. Before MAPI/HTTP was turned on Outlook connected just fine over DA. Do you have any experience / idé what could be the problem using MAPI/HTTP over DA? So, if im not misunderstood, the same namespace as the one used for RPC/HTTP can be used for MAPI/HTTP? Hello, Were new to MAPI. Dont fully understand it. Can you please explain what https://mapi.accessabacus.com/mapi and why were putting in an internal URL that looks like its going to another mail server? Who is accessabacus.com? Im only asking this because when we applied the command, looked like nothing happened, then when we applied the command, Set-OrganizationConfig -MapiHttpEnabled $true, we got errors all over. When we look on Microsoft, the accessabacus.com URL is not mentioned anywhere. Please explain what this is. Thank you. and should we create an A Record in our DNS zone file: mapi.ourdomainname.org to reflect “mapi.ourdomainname.org/mapi” in the command? You should replace accessabacus.com with your own domain name. Also, you will need an A record that resolves mapi.yourdomain.com to your exchange server (or your hardware load balancer if you are using one). Thank you Sir… I will apply this and get back to you. VERY MUCH appreciated for your response.